The 202 - 202T modem operates at 0 to1200 bps asynchronous, with FSK modulation. It uses the latest DSP modem circuitry to insure excellent performance. 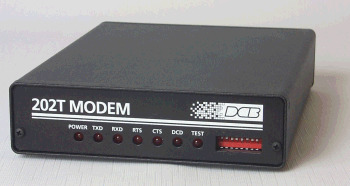 The 202T modem operates at 0 to1200 bps asynchronous, with FSK modulation. It uses the latest DSP modem circuitry to insure excellent performance and future availability. It has 900 hz soft carrier turn off for multi-drop and an anti-streaming option. 7.25" half card size, standalone and custom OEM board configurations are available. The pc card version uses the internal PC ISA bus only for power from the pc bus. The PC card fits into a 20 slot rack mount chassis that is only 7" high. The phone line connector is an RJ-11 for 4-wire leased line operation. Transmit is on positions 2 and 3, receive 1 and 4 of the 4 position RJ-11connector. The modem has a push/push switch for local digital loop on or off. The loop back switch is located on the rear of the unit, next to the DB-25 terminal connector.